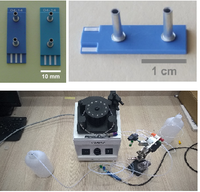 The main focus of the INTCERSEN was the development and fabrication design of innovative ceramic microfluidic devices with integrated sensing features with applications on bio-medical, environment and security. The LTCC technology versatility allowed the 3D integration of electrochemical sensing areas with microfluidic features and advanced signal processing and wireless communication. Several Experimental models of integrated sensors have been developed. The main results of the project can be found in the list of our publications: 1. R. Ciobanu, C. Schreiner, V. Drug, T. Schreiner, D. Antal, "Sensors in LTCC-Technology with Embedded Microfluidic Features, for Medical Applications", IEEE International Symposium on medical Measurements and Applications (MEMEA 2015, Torino, Italy, May 2015; 2. R. Ciobanu, C. Schreiner, "LTCC/PZT Technology for Automotive Actuator and Sensor Applications", ACEMP-OPTIM-Electromotion Joint Conference, Side, Turkey, september 2015; 3. C. Schreiner, R. Ciobanu, A. Iavorschi, P. Fanjul Bolado, "Design of Sensors in LTCC-Technology with Embedded Microfluidic Features"", 51st International Conference on Microelectronics, Devices and Materials (MIDEM 2015), Bled, Slovenia, September 2015; 4. H. Ursic, B. Malic, D. Belavic, M. Jerlah, A. Bencan, K. Makarovic, C. Schreiner, R. Ciobanu, I. Mercioniu, P. Fanjul Bolado, "Integrated Sensors with Microfluidic Features Using LTCC Technology", M-ERA-NET Conference 2015 at the EMRS 2015 Fall Meeting, Warsaw, Poland, September 2015; 5. C. Schreiner, R. Ciobanu, I. Mercioniu, T. Schreiner, "Microfluidic Sensors Using LTCC Technology for Environmental Monitoring Applications", 15th International Conference on Environmental Science and Technology, Rhodes, Greece, September 2017; 6. I. Mercioniu, A.M. Vlaicu, R. Negrea, C. Ghica, "Study Concerning Oxidation Processes of NiCoCrAlY Bond Layers for Thermal Barriers Coatings", 9th International Conference on Nanomaterials - Research & Applications, Brno, Czech Rep., October 2017; 7. R.F. Negrea, C. Ghica, N. Kaur, R. Ciprian, C. Istrate, "Microstructural Characterisation of BNT-BT Ferroelectric Thin Film by Advanced TEM Techniques", 9th International Conference on Nanomaterials - Research & Applications, Brno, Czech Rep., October 2017; 8. A. Kuncser, A. Stanciu, A. Catrina, G. Schinteie, V Kuncser, "Micromagnetic Analysis on Lamellar vs. Disperse Structures of Fe Nanoparticles in Au Thin Films", 9th International Conference on Nanomaterials - Reasearch & Applications, Brno, Czech Rep, October 2017. In the Figure can be seen the LTCC structures with different dimensions, The model of designed structures and the special injection system with peristaltic pump, reservoirs and pressure injection.